What an interesting read! I will admit that the book started off rather strangely to me, with whales and an oceanic beginning. It was slow to begin but most definitely picked up the pace. This fantasy is one that will make you analyze your own being and the way that you think. What a fantastic book. I was initially a little worried when reading The Question because it started a little slower than I expected. In fact, it wasn’t until chapter 13 that the book really became intriguing. While reading, I was so caught off guard, I had to go back and reread the section- twice. Fascinating…mind-boggling…an answer to one of the biggest questions we human wonder about??? This book innocently but powerfully presents and unwraps a deep philosophical concept that provides a mind-boggling perspectives on the brain, acquisition of knowledge, generation of insights, the phenomenon of “having visions”, and the wondrous intelligence that permeates all living creatures. What would you want to know or would you? At first when I started reading this story I thought, what a neat concept of getting a lot of people together to think about one question and see how several people come up with the answer at the same time, why/how does that happen? This story really gets you thinking of all the possibilities of being able to answer a lot of important questions in this world. How many of us have asked why are we here? Who created the world? In fact, who created the whole universe? It’s frustrating not to know more than what science has discovered. This is the same curiosity that befalls Nate Heartnell at the Center for Cognitive Studies. Nate is trying to find the truth to the answer that is at the core of humanity. There are people who embrace, and others that feel threatened. I’ve been recently taking an introduction to philosophy class, and I have to say that I am really enjoying it. I’ve been reading passages from books by Plato and books about Socrates and I think the topic is very intriguing. But as of lately, I’ve been looking for a modern fictional book that highlights some of the questions that the great philosophers before us asked. And, I’m very lucky that this book just happened to land in my hands. This was such an engaging read! 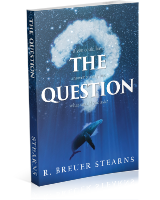 The Question revolves around, wait for it, the idea that there could be a way to receive an answer to any question that you might have, and that there could be people who might fear that question, and try to stop you. But who? And why? I won’t go into details because I’d spoil a series of cool plot twists, but suffice it to say that if you’re looking for a book that spins an interesting storyline while asking compelling, challenging questions, this is one to pick up.